If you want to Volunteer in Siem Reap then our Child Protection Workshops are for you. These are an excellent introduction to Cambodia with a focus on best Child Protection practices for volunteers working with children and vulnerable people. Volunteering in Cambodia can be very rewarding, this workshop will help you to get the most out of your experience and get the most value for the organisation you volunteer with. Since January 2012 we have been running one day workshops for volunteers who come to work with children. We have also had many Cambodian staff members who have attended and have found them useful. These sessions are run in English so a pretty good grasp English language is necessary. They are very interactive and include a mixture of ice breaker sessions, instructor lead activities, group work, and whole group activities. The price is $15 per person, which includes morning refreshments and several handouts. The workshops run from 9.00 a.m. until around 1.30 p.m. Lunch isn’t included and The New Leaf Eatery offers a special deal for anyone who wishes to have lunch there on training days. 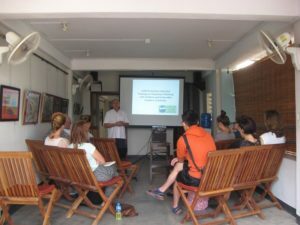 If you are a local organisation and you’d like to have a session in Khmer which includes the above as well as assisting Cambodian staff to understand about foreign volunteers and tourists visiting Siem Reap. Please contact us if you would like to arrange a workshop in Khmer.